– Welcome to the next Time for Business Growth tip, and today, we’re looking at Business Planning. I’m going to give you a simple way to plan your future business. No 10-page essays, just a concise plan of where you’re heading and what you want to achieve. Sound good? Then listen on. Are you sometimes so busy in the day-to-day to look up to see where your business is heading? Perhaps you keep meaning to spend time looking at your business but other things come up, or perhaps you just aren’t getting results you want from your business. Very busy or busy procrastinating, but not getting the results in actual hard cash. The thought of spending hours or days analysing your business just sends you cold, and who knows what could happen the next 5, 10, or 15 years, right? You’re not sure what next month will look like. But something easy but practical, perhaps visual, that may be the tool you need to keep your focus on taking the right next steps for your business. First, is your business worth 15 minutes? I know time is a premium, but we’re talking about the thing that is going to provide you with an outlet for your amazing product or service and income, and hopefully a growing one. It deserves 15 minutes. You deserve 15 minutes. So grab something to write with, a pen or a tablet or a keyboard. You’re going to look at three areas. Pause between each section to note down your answers. If you don’t know, guess. You can refine it later, but get something down. Number one: Turnover and Profit. What is your average turnover per month? Estimate if you don’t have it. That’s how much you make in sales in total in a month. Is it £100, £1,000, £10,000? Now, in 12 months time, do you want that to increase, decrease, or stay the same? If you want that to increase, then by how much, 10%, 50%? Three times the amount? Ten times the amount? And make a note of your profit, too. Remember, it’s the profit in your business that counts. You can spend all your time raising your turnover, but if you still make no profit, then, is it worth it? What is your average customer spend? A quick way is to look at your monthly turnover and roughly how many customers you have. If you have five customers and £500 per month, the average customer spend is £100 per month. And how many average customers are you going to need to achieve that desired monthly increase? Is it 5 customers, 10, 100, 500? And does that feel doable? Perhaps a little bit scary? But something that you feel you can achieve. Next, who is your current ideal customer, and why? Are they a good payer, a regular order, a big spender, or they’re just lovely to work with? How did you attract them? Was it an advert? If so, what sort and where? Was it through networking? Perhaps word of mouth or referral from another client? Perhaps they just came into the shop? Area number three is Support. Who’s gonna help you over the next 12 months? 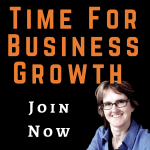 Who is going to free your time to grow your business? Will you actually need staff to achieve the results you want or the services of others? What new skills will your business need, and will it be you, the staff, or the services of others that provide those? Finally, what should you be getting others to do? Not a case of can you do it, but should you do it? You need to use your time and talents wisely to grow your business. So you should now have three crucial answers. How much in sales do you want this time next year. How many average customers would it take to achieve that, and Who’s gonna help you get there? Well done. You’ve spent 15 minutes on your business and got some of the answers to help you take the next steps. This shows that it doesn’t take hours of planning if you don’t have it to make the first steps. Your business is suffering if you don’t stop and look at where you’re going regularly. You won’t reach its potential if you just keep ploughing ahead and hoping. It will take a lot more work and potentially cost a lot more in the long term. That’s a lose-lose situation. You and your business is worth more than that. If those three answers have encouraged you to take the next step, then head to amandaholges.co.uk/BizPlan, that’s B-I-Z Plan, and download my Time for Business Growth Business Planning Sheet to get more insight on how to achieve your desired turnover and ultimately improved profit in the next 12 months. It doesn’t take days of pouring over figures, but it does take you time to stop and look at where you want to be. You need to look at the bigger picture. If you know where you’re heading, it is so much simpler to get there. You may already have the figures available, and a good idea of what you want to achieve and how. Great, this will help you get the focus on the next key steps. Or you may struggle with figures and not have a clear idea of what to do. Don’t stress. Get something down and find out the rest or get support from someone that can help, and that could be me. Head to amandaholges.co.uk/BizPlan, and take the next step towards your future today. Speak soon.